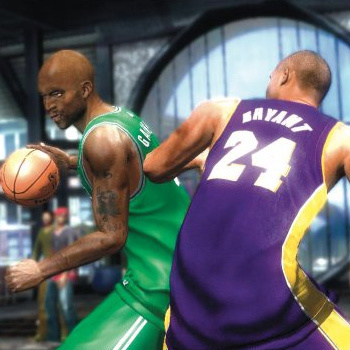 NBA Ballers is the exclusive one-on-one basketball videogame highlighting the "bling-bling" lifestyle of NBA Superstars; chromed-out cars, ice, ladies, tatts and jets all hinge on the killer cross-over. NBA Ballers also features NBA Legends dropping dimes and dunking in your grill to determine who is the greatest baller of all time. 60+ NBA Players: Including Kobe Bryant, Vince Carter, Allen Iverson, Kevin Garnett, Shaquille O'Neal, Yao Ming, Steve Francis, Chris Webber, Gary Payton, Latrell Sprewell, and more! 24 NBA Legends: Including Rick Barry, Larry Bird, Wilt Chamberlain, Clyde Drexler, Julius Irving, Magic Johnson, Bill Russell, Jerry West, James Worthy, and more!